On a recent trip to Kailua-Kona, Hawaii, to cheer her daughter on in the IRONMAN World Championship, Upper Valley resident Diane Kelly had the opportunity to do a little sightseeing. Like many visitors to Hawaii’s Big Island, she and her family were eager to see the famous black sand beach created by the meeting of hot lava and ocean, but doing so meant navigating their way down and back up the challenging inclines of the volcanic terrain. Just a few years ago, the expedition would have been out of the question for Diane, who has arthritis and had struggled with weight issues. As she says, “I would not have been able to do it. I would have been sitting up at the top, waiting for them to come tell me how incredible this black sand beach was.” After more than a year of exercise at the Upper Valley Aquatic Center, though, Diane had the strength and fitness to tackle the trek and join her family on the beach. 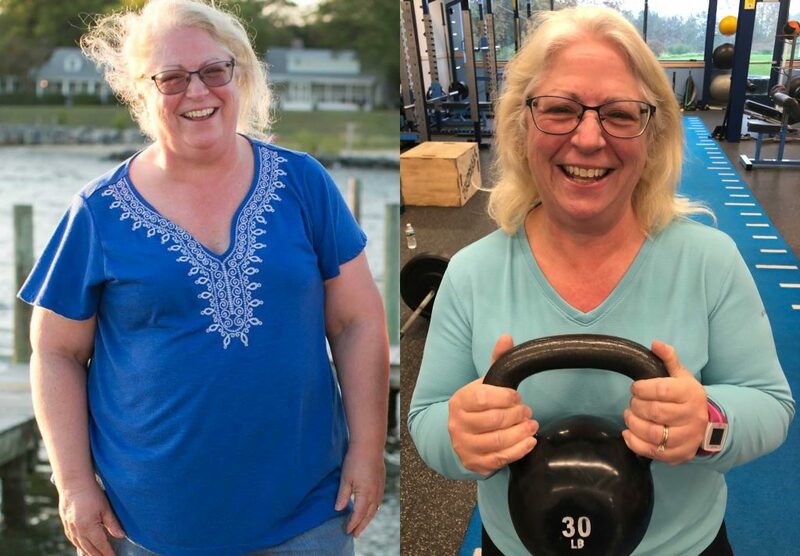 Diane began working out at UVAC in May 2017 at the suggestion of the team at the Dartmouth-Hitchcock Weight & Wellness Center, where she had begun making progress with weight loss. Regular exercise was strongly encouraged and the team recommended UVAC, so Diane signed up for a three-month introductory program and began working with Erin Buck, a personal trainer and fitness instructor. Diane says she enjoyed working with Erin, who understood her challenges and was always supportive and encouraging. After three months of personal training from Erin, Diane knew she had found the right gym for her and signed up for a year’s membership. Since joining, Diane has expanded beyond her personal training sessions to take group aquatic classes. “One of the things I liked about UVAC when I first started was the idea of a warm water pool,” she says. “But I hadn’t gotten into it, and then one day I just decided I was going to take a class. And I’m very glad I did.” Diane finds the warm water refreshing and the workouts gentle on her arthritis. In addition, she enjoys catching up with other regular attendees and receiving instruction from both Erin and Signe Linville, a swim team coach and aquatic instructor, who ensure that the classes include a good balance of fitness and fun. Recently, Diane has added UVAC’s Shed and Shred program to her exercise routine. After finding herself in a bit of a workout rut, she took Erin’s advice and signed up for the eight-week program that focuses on weight loss, strength training, and cardiovascular fitness, all within the supportive environment of a small group led by a personal trainer. At the three-week mark, Diane is enjoying the experience, and is particularly appreciative of the modifications offered for participants with injuries and health conditions to consider.